valuable offerings. 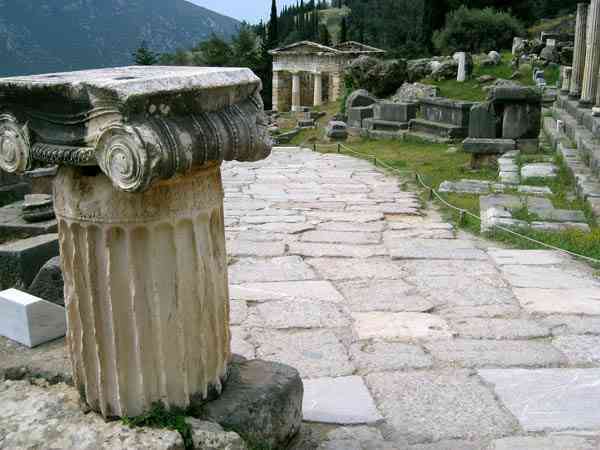 The sacred way reaches up to the temple of Apollo and then the path leads up to the theatre and the stadium. From the main entrance the Sacred Way leads obliquely up; in Greek times it had level stretches and steps (of which traces can be seen on the lower courses of the Altar of the Chians) but under the Romans these were replaced by the present graded slope, though some of the paving was laid by the recent villagers. Much of the first stretch is bordered by bases for statues, now vanished. Just inside the gate on the left was the Spartan monument for their victory over the Athenians in 405-4, erected next to an earlier Athenian memorial of their defeat of the Persians at Marathon; and across the way the Arcadians afterwards found a place for their monument to advertise the humiliation of Sparta in 369.